Join the CEO of our sponsor, Joe Gorton as he guest hosts the show today. We are fortunate to be joined by Salt Lake City firefighter Evan Fitzgerald. Evan is doing some amazing work with peer support and this is one conversation you don't want to miss!! My name is Evan Fitzgerald, I also go by the nickname Fitz. I currently work full time for Salt Lake City Fire Department, and part time at North View Fire District as the Health and Wellness Coordinator. Establishing and managing ... See More programs that support Frontline Athlete wellness is my passion. After working six years as a health and wellness coordinator, I have motivated changes that have made a positive impact throughout the state of Utah. With the help of awesome mentors, I developed the Firefighter Fitness Coordinator Certification curriculum, which the Salt Lake City Fire Department currently uses. I began building a powerful respect for the Frontline Community the day after I turned 7, when Firefighters and Paramedics responded to my farm house. As my brothers and I waited to be taken to school, a tractor accident instantly took the life of my Dad. After the Firefighters explained that nothing could be done, my older brother immediately began punching one of the crew members pleading for him to fight for our Father’s life. I spent the next 10 years analyzing the meaning of that day. I began to understand how honorable it was for those Firefighters to respond to the chaos of my worst day. At the age of 17 I was given a “paid on call” position at the Mountain Green Fire Department, beginning my career as a Firefighter. I then became an EMT and soon after became a Paramedic. After another 10 years of responding to the homes of devastated grieving families, I felt the burden carried by the Firefighter who, years earlier, allowed my brother to hit him and who also listened to the plea of my broken family. The compounding weight of exposures to trauma, sleep deprivation, and constant stress caused me to buckle. 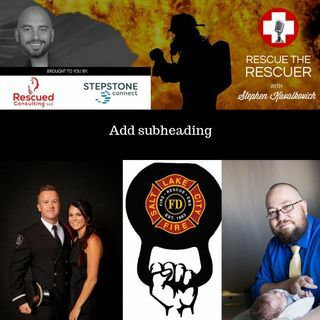 These experiences sent me searching for ways to support the wellbeing of First Responders after hearing and seeing similar struggles in fellow Firefighters. As I began formulating an understanding of Frontline wellness issues, I searched out the specified certifications that would support my pursuit. I earned my Tactical Strength and Conditioning Facilitator certification through the National Strength and Conditioning Association as well as my Peer Fitness Trainer certification through the International Association of Firefighters. In furthering my understanding, I consumed any relevant research that I could. I found that fire departments not only needed the information that I discovered, they also need systems to incorporate the practical application of that information. Developing an implementation strategy was the next step so I took what I learned to the respected individuals in my Department and they helped me figure out the best way to present this information to the Administration and Union, who eventually gave their support. Using evidence-based information as the framework, I developed a holistic wellness system. I put this system in a 700-page text that has been reviewed by experts in Nutrition, Psychology, Exercise Science, and sleep medicine. It’s used as the main resource for our “Fit to Respond / Fit to Retire” certification. To bring all Frontline members together in this wellness effort, I developed a competition called the “Frontline Throwdown”, which is a yearly event held at the Utah Fitcon. This event allows teams from Military, Police and Fire groups to use their tactical fitness in a non-emergency event as well as provide a wellness training platform which is expanding this year to include 12 hours of training. My success isn’t mine alone, not only have I had exceptional mentors, I also have an amazingly supportive family. My wife Sarah has assisted me with Firefighter spouse trainings. She’s patient with my long work days, and she definitely takes on more than her fair share of responsibility around the house. When I’m not at work I love spending time with her and our three boys. We enjoy traveling, swimming, Flowrider surfing, indoor skydiving, skateboarding, and boating. Each of my boys ages 9, 5, and 3 are awesome and contribute in their own way. The main drive behind my work is to give my family a living example of the value within the struggle to find meaning in chaos, and then managing the responsibility of that uncovered potential.